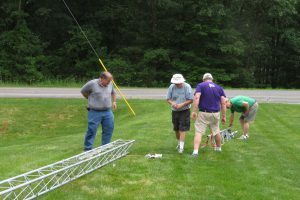 SCARA members prepare for Field Day by setting up tower for antennas. Field Day is coming this weekend!! Come and join us from our site at the Wilton EMS building. Setup starts on Friday. We will begin to gather at noon to start the preliminary setup. This involves mainly the tower and antennae. Usually, we work until about 4 or 5 PM and break for the day. On Saturday the fun starts. The stations are set up and lunch is served. Then at 2 PM, for 24 hours we will be exchanging “3A ENY” with as many other stations around the country as we can. We need help on Friday afternoon to start the setup. We need help on Saturday morning to finish the setup. We need help Saturday afternoon to Sunday afternoon to operate. We need help Sunday Afternoon to disassemble and clean up everything. Come on down, help out, and have some fun.